Since 19th century, Surabaya had a famous downtown every where which call Kembang Jepun. That time Kembang Jepun had two functions, as a business centre and downtown. In the next century Kembang Jepun as "Wall Street" doesn't change, but Kembang Jepun as downtown already change with Tunjungan. In 21st century the role of Tunjungan change by modern malls at side cities. Situation always changes. Sometimes really change, sometimes just roll like wheels. â€œThe Sinkingâ€� of Kembang Jepun and Tunjungan, make Surabaya as city had lost the important icons. Thatâ€™s why, recreated Kembang Jepun as new icons Surabaya city. So, if other big cities in the world always have a unique part of town as Kya-Kya (walk street), Surabaya with a new Kembang Jepun will be exist. This icon named with â€œThe Centre Kya-Kya Kembang Jepunâ€� (PKKJ Surabaya). Kya-Kya is Chinese language thatâ€™s mean Walk Street. The chosen this name because Government of Surabaya hopes the Jepun area can live at night. 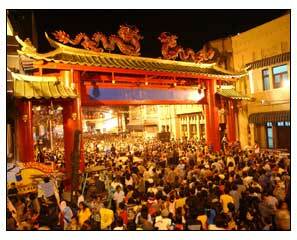 The chosen name of Kya-Kya because the Kembang Jepun area known a famous China Town area. Even though, in the history, Jepun already as most busy area since Dutch colonial. Not far from Kembang Jepun, there is Jembatan Merah (Red Bridge) the famous historical icon.